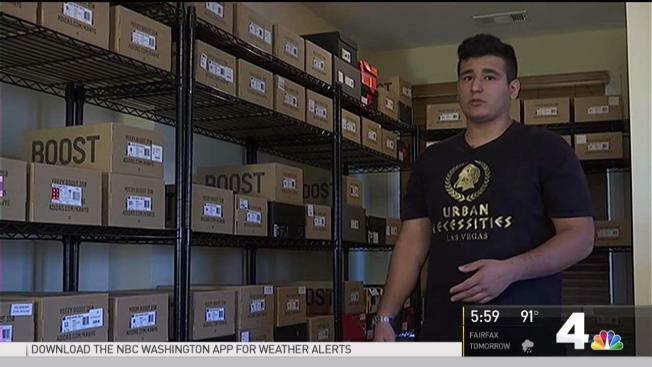 A 17-year-old boy is running a designer sneaker business that he says already has brought in more than a quarter million dollars. Gautam Malik runs Kickz Malik out of his family's house in Arlington, Virginia. He's a middleman for "sneakerheads," buying low and selling high to stores. The rising high school senior is only 17 now, but he already has been selling sneakers for five years. He said he made his first sales when he was 12 -- first to friends and then online. The work keeps him busy. "I like to get stuff from here to the store in a day or two. Just keep going around, trying to get another pair of shoes, trying to make an easy flip, doing whatever I can," he said, surrounded by shoe boxes. Sneaker fantics shell out as much as $1,000 for pairs like the Yeezys, which Kanye West designed with Adidas. A lot of his classmates have internships for the summer. Malik hired his own intern. Anu Ganbold, who will be a college freshman in the fall, spends hours with Malik every day packing shoes and making sure they're the real deal. At this point, Malik, who has more than 16,000 followers on Instagram, can detect counterfeit sneakers with a sniff. "Fakes, they don’t smell the same," he said. For his next move, Malik said he's considering learning how to develop software to help his business grow.